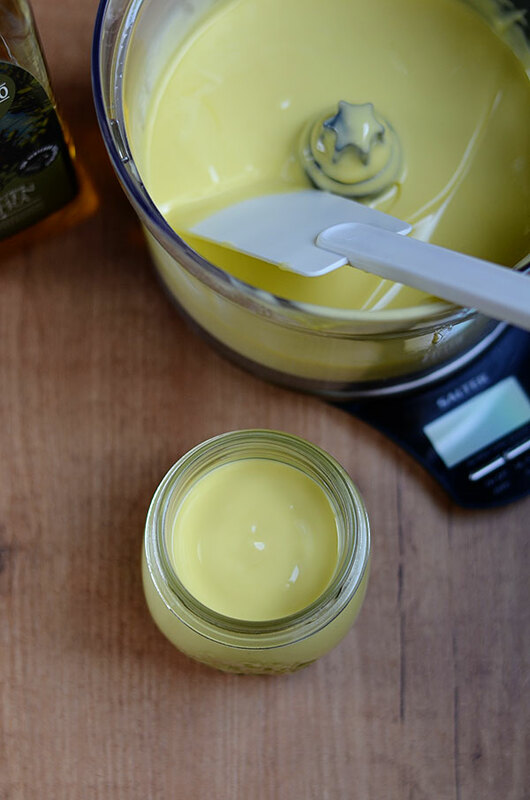 Make your own spreadable olive oil butter! It’s super easy, only three ingredients and will keep in the refrigerator for at least 3 months. Margarine is a highly processed food that was invented solely to replace butter. The primary ingredient is vegetable oil along with emulsifiers, colorants and various artificial ingredients. Without colouring margarine isn’t even yellow but an unappetising grey colour. Read more all about it here. A few years ago my mother in law bought me a beautiful stoneware butter crock . It worked perfectly in Hungary but then we moved to Spain and my poor little butter crock was no match for the Spanish heat. During the summer the butter completely melts and falls into the crock with water. So I gave up on butter as a spread because its so difficult to spread straight out the refrigerator and adopted the Spanish custom of drizzling olive oil over bread. Simple and delicious. 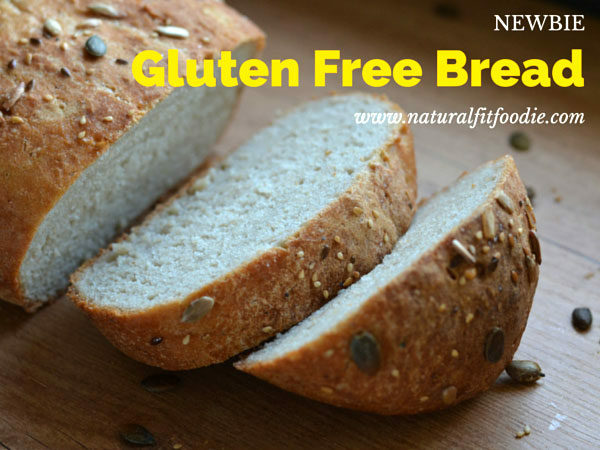 There are times though when you need a bit more umph, like on freshly baked gluten free bread for example. 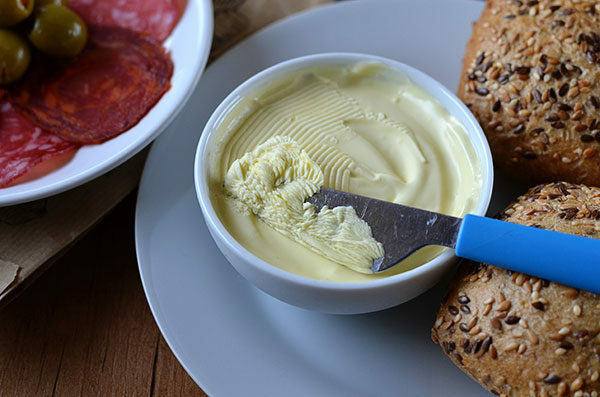 You long for a touch of soft creamy butter like the whipped butter they often serve with steak and bread rolls at restaurants. Mmmmm steak… I digress. Those times it’s handy to have this olive oil butter sitting in the fridge. It’s super easy to make, only three ingredients and will keep in the refrigerator for at least 3 months. Most importantly, it’s spreadable straight out of the fridge. This is how it’s done. 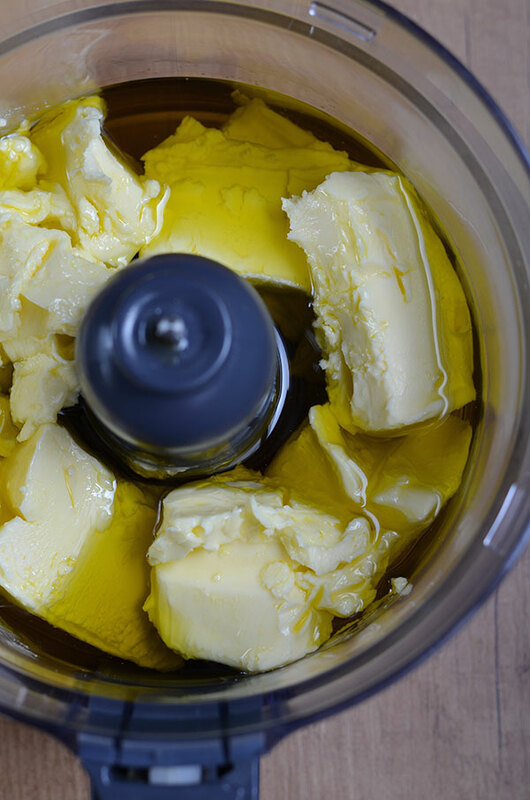 Making Olive Oil Butter is extremely easy! Step 1 : Bring butter to room temperature. DO NOT try to speed up the process by melting the butter! Doing so could result in your mix becoming grainy or separate once you chill it. Step 2 : In a food processor or using a hand blender whip unsalted butter and olive oil. Scraping down the sides of the bowl occasionally. Beat in the salt. The mixture will be pretty runny. 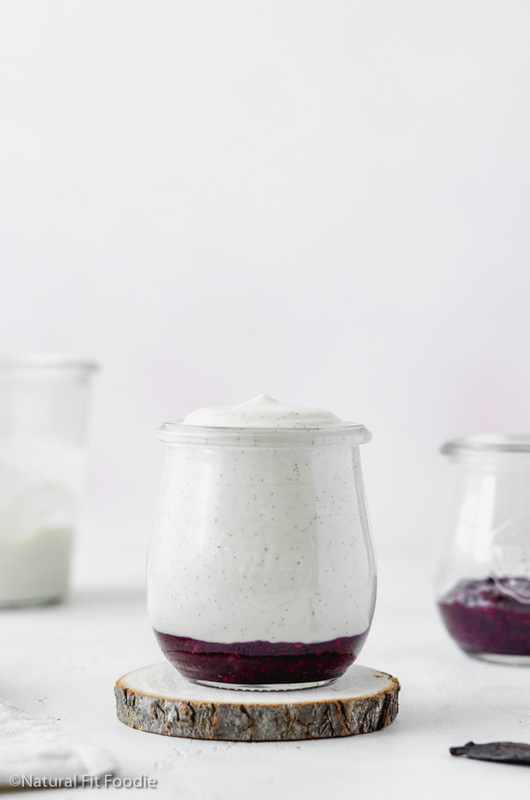 Pour it into a container that seals well and refrigerate. So there you have it, your homemade healthy spreadable olive oil butter. It’s ready to enjoy as is , or you can have some fun and turn it into a delicious compound butter. Feel free to experiment with alternative healthy oils such as avocado, hemp seed, flax seed or other cold-pressed, unrefined oils. 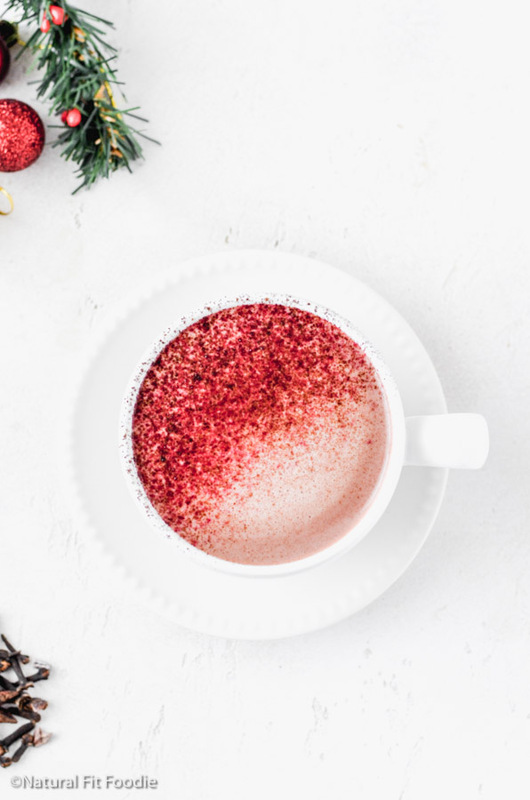 Even though coconut oil is one of the tastiest oils around I do not recommend using it in this recipe as it solidifies in cooler temps which kind of defeats the purpose of making a spreadable butter in the first place. Here’s the perfect bread for this butter! 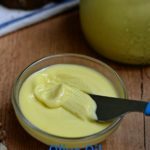 Make your own blended olive oil butter! It's super easy, only three ingredients and will keep in the refrigerator for at least 3 months. In a food processor or hand blender whip butter and olive oil. Scrape down the sides of the bowl occasionally. Beat in salt. The mixture will be pretty runny. Fat is my favorite macronutrient, so this right here totally speaks to me! Thanks for the tutorial! I’m trying to reduce my sodium intake, is the salt absolutely necessary to make the butter spreadable? Hi Lily, from a food engineering background, salt is added to butter for two reasons, preservation and taste. As you probably know, bug or microorganisms need water to survive and cannot grow in pure fat. Water in a butter product forms tiny droplets that are suspended in the fat-phase. As salt has a greater affinity for water over fat, it will naturally occur in the water droplets. just like humans, too much salt is not good, so concentrating the water droplets with salt will prevent the microorganisms from growing. Has very little effect on the spreadability. Hope this helps! I would have thought a reduced shelf-life, as you are mixing unsaturated (susceptible to oxidation) fatty acids with the butter? Not to mention oxygen incorporation when mixing. I’d recommend a check the dates on margarine around the date you make and using that as a BB date. I love this. I buy Kerry grass fed butter (salted). Can I just use the butter and olive oil? I’m not sure what you’re asking Ivon? You can skip the salt if u use salted butter. 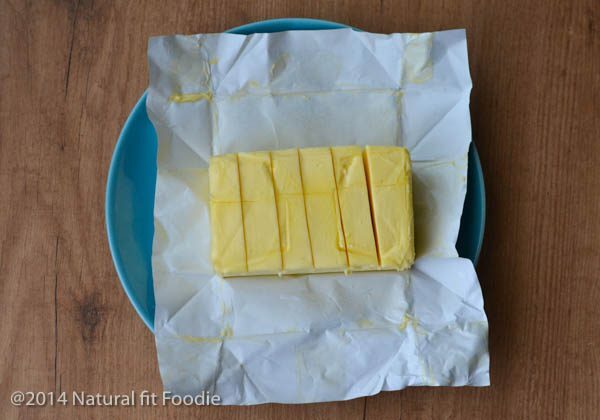 yes, you can skip the salt if using salted butter. I tried to convert 75 grams of olive oil to US cups/measurement and was unable to. ?Most liquids are measured in liters? What would be the US equivalents please! Looking forward to making this. That’s so great Angela! Happy to know you love the Olive Oil Butter Recipe. 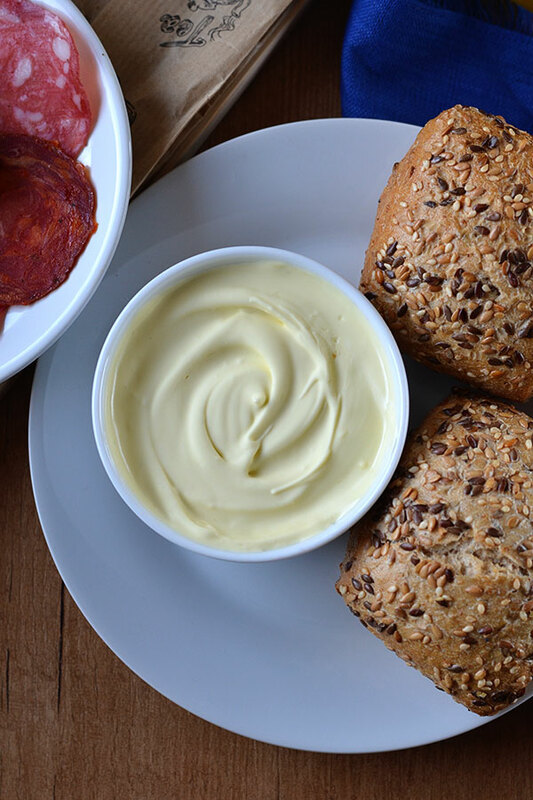 I use organic butter, olive oil and avocado oil that makes a delicious spread, great all round. 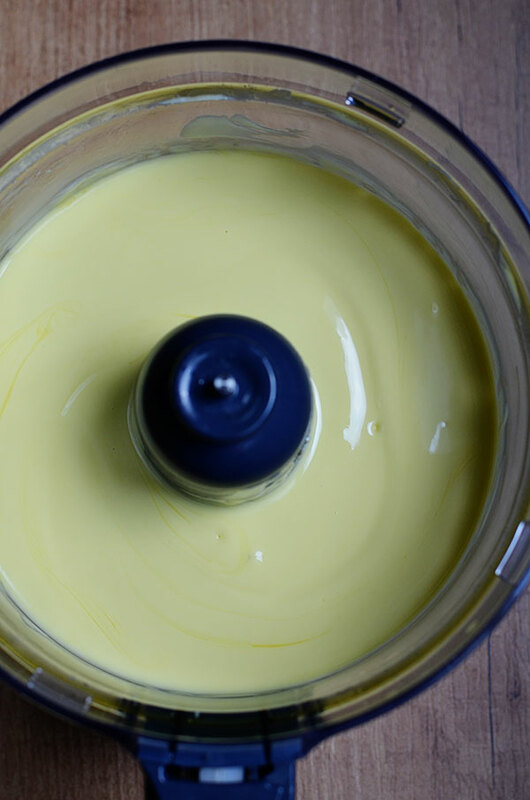 Karen avocado oil sounds like a delightful addition to this Olive Oil Butter. Does it impact on the flavour at all?